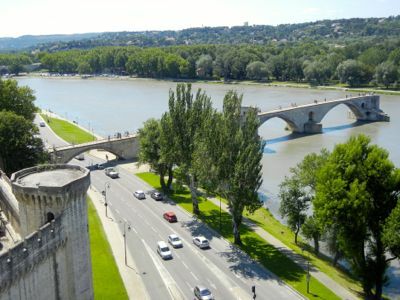 Famous in song, this historic bridge also offers lovely views of Avignon. Who doesn't know the old song? But who knows the history of the famous bridge? The bridge's official name is Pont Saint-Bénezet, after the young shepherd who, according to legend, was told a bridge should be built there, and he moved a large stone to prove it. Built originally in the 12th century, the bridge has been rebuilt many times over the years, in response to wars or floods. After the 17th century, they stopped rebuilding it after floods, and today it only spans part of the Rhône River. You can walk (or dance) out on the bridge and enjoy the views. There is a small chapel dedicated to Saint-Nicolas, the patron saint of bargemen. An audioguide is available. How about the history of the song? It's not as old as the bridge, dating from the 19th century. It was performed at the Opéra Comique in Paris, and later was the title of an operetta. There were earlier songs about the bridge, but for the most part they have been lost. 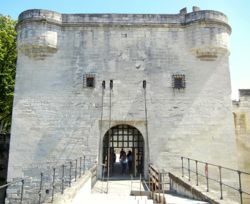 Above, Side view of the Pont d'Avignon.